1. information, ideas, or rumors deliberately spread widely to help or harm a person, group, movement, institution, nation, etc. To learn a little more about how propaganda is used, go to Propaganda Critic, and take a look around. I'd especially recommend the videos. 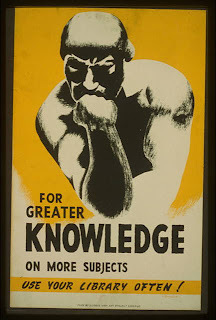 Don't you love the library propaganda poster (above) that was issued by the Illinois WPA Art Project in 1940? Library propaganda is good! I'm obsessed with the health care debate, if you can call it that. Do you think the loyal opposition realizes they've become the champions of the health insurance industry, whose only goal is to deny care whenever possible? Big insurance is already rationing care and killing thousands of people (and not just grandma), but somehow the opposition has made reform into a Grandma-killing, liberty-threatening menace. It's shameful.